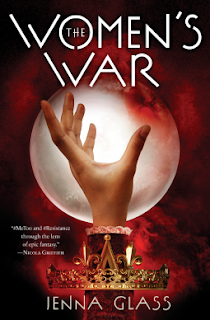 On one level the Woman’s War is a well realized high fantasy novel in which the power of magic is fundamentally changed so that it favors women. As someone who has written some high fantasy, this story really confronted me with how I fall back on traditional misogynist world building . I have always tried to show that women have forms of power within patriarchal systems, but I have never confronted the system itself in the way that this book does. Not that the prose is in anyway strident or didactic. It takes an event that undermines the power of a number of kings in bordering lands, and it tracks through the consequences for a number of key people. Illegitimate princess Alysoon is the most focal character but an ensemble of other male and female also have their perspectives revealed. Most striking is how the plot reveals the sacrifice of compassion and care-taking that people often make when trying to serve the greater good—whether that is a king desperate for a male heir, or girl facing a forced marriage to protect her brother’s safety. It is from this point of view that the poignant ending is an intense combination of victory and defeat. The Woman’s War is a story of court intrigue, wars and love between well realized characters in a well-built fantasy world. It includes a speculative element more common in sci fi than fantasy—but maybe this is more a result of lazy thinking by writers including myself who tend to lean heavily on familiar fantasy tropes. Because this novel does not sacrifice anything in terms of entertainment value in the course of being—for the thoughtful reader—a great deal more.